What’s the quickest way to make your lettering look more impressive? Adding flourishes to your lettering can completely transform the look of the piece. It can take a piece from “basic” to eye-catching with only a few extra curves and loops. For this step by step beginners tutorial we’ve teamed up with the talented calligraphy duo – Loveleigh Loops! Before we get started we would like to thank both Jillian & Jordan of Loveleigh Loops for creating this absolutely amazing step by step tutorial that is just jam-packed with value! Jillian & Jordan, the founders of Loveleigh Loops, are twin sisters who teach calligraphy through online courses. They’ve created a highly engaged and supportive online community around the shared interest of lettering & calligraphy, years after taking their first calligraphy class at age 11. Their background in analytical fields (Jillian studied data analytics and Jordan studied engineering) have influenced their teaching methods. They’re able to breakdown the complicated discipline of calligraphy into a step-by-step system that even complete beginners can understand. The sisters are passionate about helping letterers of all levels become the artist they know they can be. Without any further ado let’s get down to the tutorial! Flourishing is another word for embellishing. Adding embellishments to the letters can make a word look more fancy, decorative, and noticeable. Flourishes can range from simple to complex. Simple ones are made of basic curves and loops, while complex flourishes have curves that cross over themselves multiple times and can even have small loops inside larger ones. You can flourish a single word or an entire layout to interlock the words together. For now, we will focus on flourishing a single word. The purple lines are extensions off the letter base. They add style to the letters and fill up space around the word. So now you might be wondering, how do I make flourishes? And how do I know where to put them? Let’s start with the “where”. Some areas within a word are better for flourishing than others. Because adding a flourish extends a letter beyond where it normally “lives”, and you want to make sure legibility isn’t compromised. Adding flourishes to these 5 places (rather than random spots in the letters) helps make sure the word remains legible. You may gravitate towards 2 or 3 of these spots, so don’t feel like you have to use them all! In fact, a word might not even have a loop or t-crossbar which would take away that opportunity. But if you’re stuck, think about these 5 places to get you started. Now that you know where to add flourishes, the next question to answer is how do you make them? And even more importantly, how do you make them look beautiful? So that means everything leftover (not in blue) makes up the flourishes. All of the lines are smoothly curved and based on an oval shape. Oval-based shapes makes the flourishes appear graceful and consistent rather than choppy, irregular, or random. 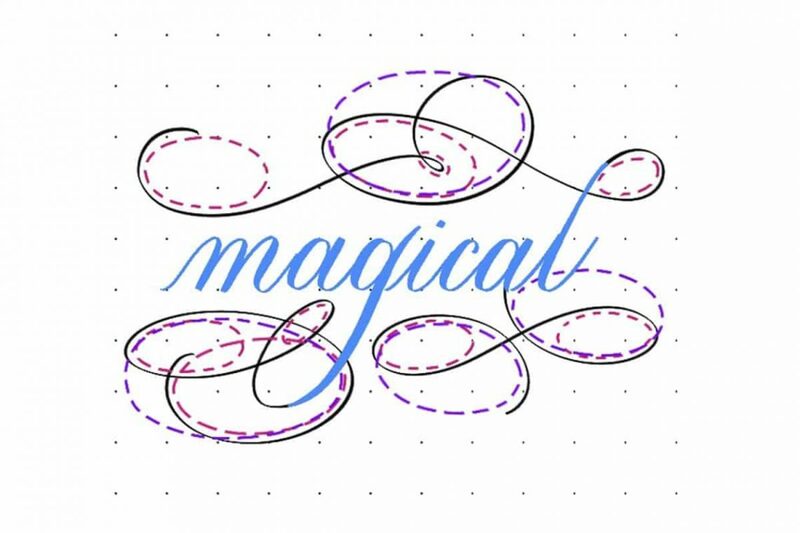 The trick is to think about tracing, or “wrapping around”, an oval as you make a flourish. When you break it down that way, flourishing seems more manageable! Before you jump in to flourishing letters, it’ll help to start with some drills. The first set of drills will get you used to creating oval shapes from all directions and orientations. Use a pencil and do them as many times as you can until you feel comfortable! In addition to complete ovals, the c-shape and s-shape are also very commonly found in flourishing. In fact, they are based on the oval! The c-shape is just half of an oval, and the s-shape is formed by two ovals next to each other. When you’re able to make smooth, consistent ovals, c-shapes, and s-shapes on their own, you’ll feel much more confident using them in your flourishes. 3. Do not cross two thick lines. If you keep your flourishes based on the oval shape, cross at 90 degrees, and avoid crossing two thick lines, you’re setting yourself up for successful flourishing! Now we’ll look at some examples for each of the 5 types. Remember, the flourish acts as an extension of the base letterform. Pay attention to the 3 rules you learned above (oval shapes, 90-degree angles, and crossing thin/thick lines) as you look at the examples. You can use these upper loop flourishes for any letter in this group: b, d, f, h, k, and l.
The flourishes used in the “g” can also be used on the descending loops of: f, j, p, q, y, and z. The “tail” of the h-flourish becomes the crossbar of the “t”. You can use theses shapes at the end of a word or line as long as it doesn’t interfere with the legibility. For instance, the upper loop letters wouldn’t easily be able to use these because the flourish would run into the letter. These word flourishes work best on non-descending letters that naturally dip down at the end, like r, m, a, and n. Avoid using on letters that finish upwards to complete the letter shape, like e and c.
So now you have a toolbox of 25 different flourishes to draw from! It can be tempting to flourish every possible letter in a word. But, it’s very important that the letters are still legible, and sometimes less is more. Do not sacrifice legibility when adding style. There are endless ways to create new flourishes by changing up the shape of these examples. Now let’s put these into practice. You can apply the same concepts (changing up the loop size and angle, size of the “tail”, number of intersections, spirals, and adding inner loops) to other flourishes as well! Use this as inspiration, and be creative with your own letters. A bonus way to add flourishing to your word is by using entry and exit swashes. This works best when you have a single word or short phrase centered on a page with room on either side. You can add these to a plain, non-flourished word to give it some extra embellishment, or add on to a simple flourished phrase. Drop your email below so we can send you the practice sheets. Flourishing can transform a piece from “basic” to eye-catching. It’s an easy way to add style to the letters and fill up space around the word. The shapes should be large enough that the flourish looks intentional. A tiny loop might look like a mistake or a distraction. Maintain overall balance by placing flourishes evenly around the word. And most importantly: do not sacrifice legibility when adding style! Loveleigh Loops have created a free one-week online course that will take your flourishing skills to a whole new level. The course is open to everyone no matter your skill level, so don’t dwell on this amazing offer and learn a new awesome skill! You can join the course by clicking the button below. Join the FREE flourishing course!